A recent observer programme for Vietnam’s Fisheries Improvement Project (FIP) monitored the effectiveness of C-hooks on long-line fishing boats. Coral Triangle Programme Marine and Fisheries Advisor Keith Symington expounds on how such hooks may help save turtles, without negatively affecting target catch. An observer programme in Vietnam for C-hook trials on longline fishing boats, conducted from February to April 2017 as part of Vietnam’s Fisheries Improvement Project (FIP), has confirmed the feasibility of using circle hooks (or C-hooks) among tuna fishers in Vietnam. It has further confirmed how such hooks indeed reduce sea turtle by-catch—a serious problem in Vietnam, where very few historical turtle beaches now have viable populations—and how they may actually increase target yellowfin tuna catch. This is stated in the report of the Vietnam Yellowfin Tuna FIP Coordination Unit (composed of representatives from WWF-Vietnam, the WWF-Coral Triangle Programme, and the Vietnam Tuna Association, VinTuna) on three observer trips from Dong Tac ward, Tuy Hoa city, Phy Yen province. 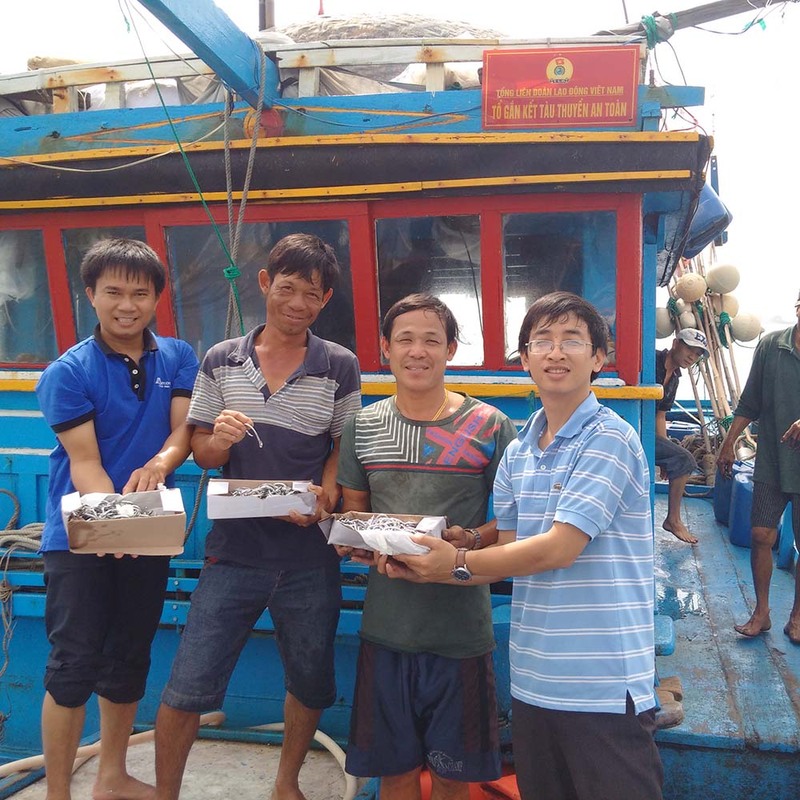 The coordination unit provided technical support, while WWF-Vietnam, WWF-US, and industry partners, specifically international seafood suppliers Sea Delight and Anova, provided funding for the trips, on which a combination of traditional J-hooks and the newer C-hooks was used. The report emphasizes that by-catch mitigation—in this case, particularly of sea turtles—is a key goal for better fisheries management in Vietnam. International trials, as well as a 2011-2012 study with WWF-Vietnam and the National Oceanic and Atmospheric Administration (NOAA), have already shown that replacing J-hooks with C-hooks can reduce sea turtle by-catch by as much as 85 per cent. The C-hooks have been under study by industry partners and stakeholders since 2011. C-hooks are also among the by-catch reduction and fisheries management measures recommended for non-member countries like Vietnam by the Western & Central Pacific Fisheries Commission (WCPFC), Symington adds, to conserve and manage highly migratory fish stocks in the area, including tuna. C-hooks come in several sizes; bigger ones make it easier to release sea turtles caught on hooks, but smaller ones, while still reducing by-catch, are generally perceived as better for securing fish, the report explains. Consultations with vessel owners and captains resulted in a compromise, where a median size 14 was chosen. VinaTuna and WWF also used a formula for calculating catch per unit effort (CPUE), or roughly, the effectiveness of a hook. Although the sample size for this experiment (four boats, using a total of 49,350 hooks) is rather small to derive clear scientific conclusions from this single set of experiments, results were encouraging, and in line with the international scientific consensus regarding C-hooks. For yellowfin tuna fishing, the CPUE of the size 14 C-hooks was significantly higher at 8.65 kg/100 hooks, as compared to 5.93 kg/100 hooks for the J-hooks. The average size of tuna caught by C-hooks (47.3 kg) was also slightly bigger than of those caught with J-hooks (44.6 kg). No turtles were caught by the C-hooks for the duration of the trials. In contrast, two sea turtles were caught by J-hooks—and were successfully released alive. Although further trials are required, such a finding will certainly help in terms of “future buy-in and support from the fishing community, and may help alleviate some concerns that there would be negative economic impacts from C-hooks,” notes the report. The observer programme was the other focus of the study, being another important element of the FIP Action Plan. The WCPFC is batting for permanent coverage of 10 per cent of all fishing trips; the goal, the report states, is a permanent observer programme for Vietnamese tuna fisheries jointly run by the national industry and the Vietnamese government for better data collection and, in the long term, for the fisheries’ sustainability. 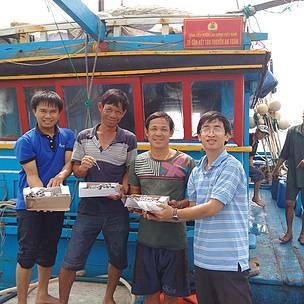 For these trials, the report notes, candidate observers included staff members of the Research Institute for Marine Fisheries (RIMF) in Vung Tau, and local fishermen and boat staff who received training from VinaTuna staff on fish taxonomy and proper data recording. Ultimately, both an expanded observer programme and the mainstreaming of the use of C-hooks should be part of a national turtle by-catch mitigation programme. Other components, Symington adds, would be training of government technical staff and vessel captains in on-board observation protocols, knowledge exchange with other members of the Pacific community, and electronic logbooks and video monitoring to make such management fully electronic in five to 10 years. © VinaTuna - C-hooks are turned over to Vietnamese fishermen and boat operators before the observer programme, to be used as a lower-impact alternative to J-hooks.